Our Jubilee Yarn Jubilee Yarn - Titanium scissors are high quality scissors at a great price. Perfect for any arts and crafts fanatic or even good for use around the home and office. These scissors are made with a Jubilee Yarn - Titanium fused blade that stays sharper longer than competitors like stainless steel. Don't worry about them slipping! Soft grip inlays on hanfle ensure that these scissors stay securely in the hand of the user. MULTIPLE SIZES: Jubilee Yarn - Titanium Sewing Scissors Set of 3 includes: 10" dress-making scissors, 8.5" craft scissors and 5.5" embroidery scissors. MULTI-PURPOSE AND VERSATILE: Ideal for Fabric, Crafts and Photos yet great for home and office use. EXTREMELY SHARP AND STRONG: Sharp blade for Clean Cut - Comfortable Soft Grip Inlays on Handle - Jubilee Yarn - Titanium-Fused Blade Stays Sharp 3 times longer than Stainless Steel - Rust resistant, durable and light weight. HIGHEST QUALITY AVAILABLE: The only scissor set you'll ever need! 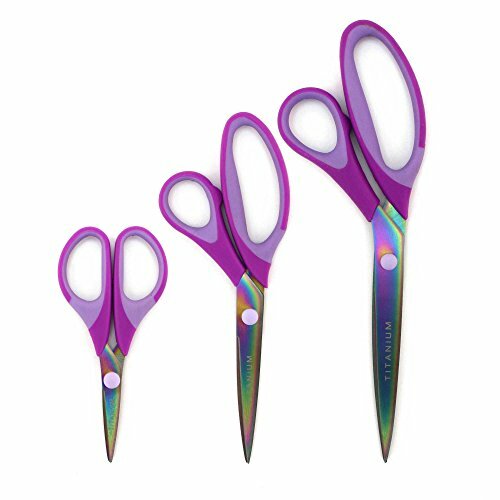 These scissors are higher quality and more durable than competitors. They are also versatile and are great for all your cutting needs. MULTIPLE SIZES Jubilee Yarn Titanium Sewing Scissors Set of 3 includes 10 inch dress making scissors, 8.5 inch craft scissors and 5.5 inch embroidery scissors. EXTREMELY SHARP AND STRONG Sharp blade for Clean Cut Comfortable Soft Grip Inlays on Handle Jubilee Yarn Titanium Fused Blade Stays Sharp 3 times longer than Stainless Steel Rust resistant, durable and light weight. HIGHEST QUALITY AVAILABLE The only scissor set you'll ever need These scissors are higher quality and more durable than competitors They are also versatile and are great for all your cutting needs.